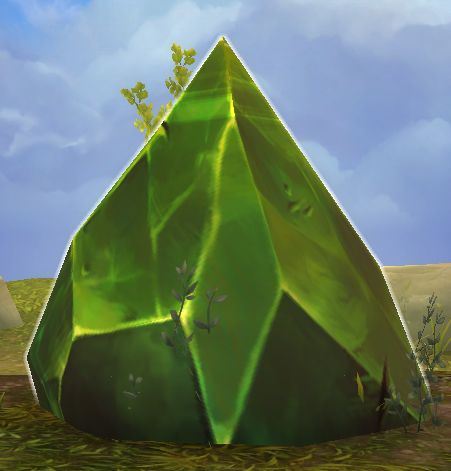 After you kill the Brimstone Destroyer, you will find a big green gem that after mining will yield five infernal brimstones, and a sixth for completing the world quest. Worth noting that if you do the world quest once, it seems you cannot mine another Brimstone Destroyer Core. I found another Brimstone Destroyer roaming around after I did the world quest once today, Core appeared but couldn't mine it. Was stuck trying to look for one of these world quests that showed up in northwest Suramar on my map, the pathway to find it started in Val'sharah at 71.9 52.0. Yes Brimstone destroyer can be in a number of different places and those locations are on the map when looking for world quests. Thought the maps are never clear in WoW. What looks like a route often proves impassable and things are not always wherte they say they are. What no-one has mentioned is when he is doing the pulsing thing he heals whilst throwing out some serious damage in all directions. You need to stop him doing that. A spell interrupt of somekind, if you have that sorted out I found it a little long winded but a soloable fight.. and worth that for the reward. On my ret pally I used rebuke, wake of ashes and hammer of justice, and utilised the opportunity provided by those to self heal. I apologise if that proves helpful and bucks against teh trend. I am increasingly finding wowhead comments full of drivel regarding Lore, pvp and who has the smallest mind and the biggest ... whatever. No real problem with that just wish they had their own seperate forum, that I could then ignore. Personally I prefer to read something that will help complete the quest. When encountering the brimstone destroyer out by Bradensbrook: DO NOT SHADOWSTEP TO IT. Twice now I've ShS'd *under the world* doing that, got instagibbed and DC'd. First time I thought it was just a bug, now I know it's a feature. Just walk up to it in stealth and punt it. In Suramar (during the world quest this week, early november 2016) he's around 23.2 / 60.0. You don't have to go down into the area near Felsoul Hold, just walk on the path north-northwest of it and you'll find him. Highmountain > Snowblind Mesa Take the flightpath to Stonehoof watch, move to Neltharion's Lair but go up the mountain at the left side of the dungeon. Spawned in Val'Sharah at 49,55 (up on a mountainside NE of Bradensbrook). I had a bit of trouble. I would get him down to 1/2 health, then he would suddenly glitch and evade, restore to full health, then continue to evade. This happened 4 times before I actually killed him. I tried moving between spellcasts and occasionally Blinking Shimmering and that seemed to keep him engaged in the fight long enough for the kill. If you relearn Mining and used the book and this quest doesn't shows up, unlearn and relearn it, but dont use the book from the vendor... the quest must popup, now complete the quest and deliver the follow up quest to learn rank 1, and then use the book from the mining vendor. I don't know what could be wrong. Just killed the Brimstone destroyer twice, couldn't mine anything. I was on my own not in a raid group. Just a heads up, also anyone have this problem too?